Vesicular neurotransmitter transporters are present in various secretory vescicles, and play an essential role in intercellular chemical transmission through vesicular storage and subsequent exocytosis of neurotransmitters. These transporters have been classified into four distinct classes, comprising vesicular monoamine transporters (VMAT), vesicular acetylcholine transporters ( VAchT ), vesicular inhibitory amino acid transporters ( VIAAT ), and vesicular glutamate transporters ( VGLUT ), in order of identification. These transporters use an electrochemical gradient of protons across the membranes, which is supplied by vacuolar proton ATPase. It has been generally accepted that cells expressing these transporters can store and secrete the respective transmitter, indicating that these transporters are potential probes for the site(s) and mode(s) of secretion of the neurotransmitters. VGLUT is responsible for the vesicular storage of L-glutamate and thus, can be used as a probe for L-glutamate-containing organelles and L-glutamate-secreting cells. 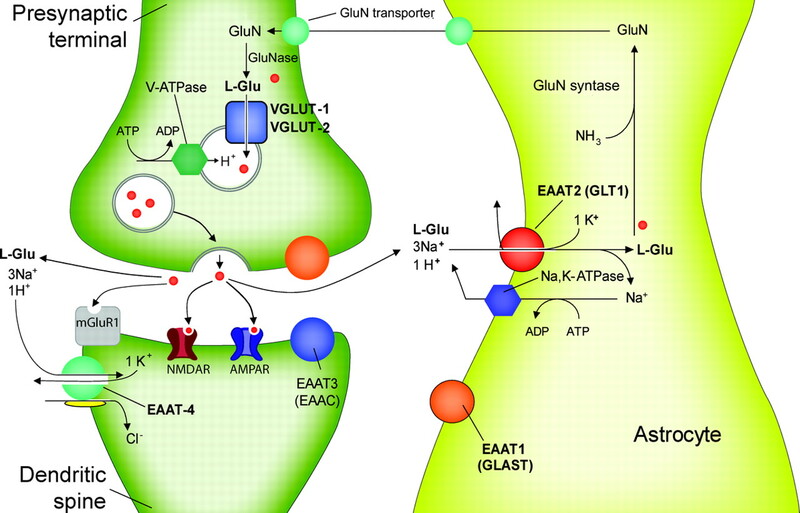 Here we briefly summarize the properties of VGLUT and discuss its role in glutamatergic signaling as a metabolic regulator. VGLUT possess 12 putative transmembrane helices and transports L-glutamate depending on the membrane potential when present in synaptic vesicles, while it cotransports Na and inorganic phosphate in the reverse direction when present on the plasma membrane of egg oocytes. Both transport activities have been confirmed in proteoliposomes containing purified VGLUT. Thus, VGLUT is versatile in nature in coupling ions, substrate specificity and direction of transport. The structural basis of this versatility is totally unknown at present but amino acid residues responsible for membrane potential-mediated glutamate transport have been identified. 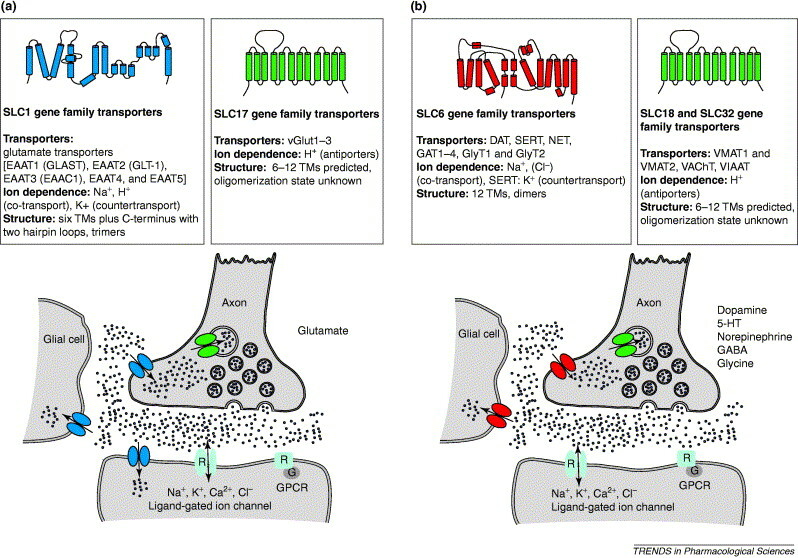 Four types of vesicular glutamate transporters are known, VGLUTs 1–3 (SLC17A7, SLC17A6, and SLC17A8 respectively) and the novel glutamate/aspartate transporter sialin. These transporters pack the neurotransmitter into synaptic vesicles so that they can be released into the synapse. VGLUTs are dependent on the proton gradient that exists in the secretory system (vesicles being more acidic than the cytosol). VGLUTs have only between one hundredth and one thousandth the affinity for glutamate that EAATs have. Also unlike EAATs (Excitatory Amino-Acid Transporters reuptake of Glutamate), they do not appear to transport aspartate. In the central nervous system (CNS), VGLUT1 and VGLUT2 are complimentarily expressed in all known glutamatergic neurons. Proteome analysis has shown that 9.0 VGLUT1 and 14.4 VGLUT2 are present per one vesicle, respectively. As expected, VGLUT1-knock out mice exhibited a loss of glutamatergic chemical transmission,demonstrating an essential role of VGLUT glutamatergic signal. In contrast, VGLUT3 is expressed and associated with vesicular structures in monoaminergic and cholinergic neurons, suggesting a different mode of glutamate signaling in the CNS. VGLUT3-knock out mice exhibited deafness, suggesting an important role in hair cells. The VGLUT3-knock out mice also exhibited increased sensitivity to cocaine, suggesting synergies striatal acetylcholine tone. Overactivity of glutamate transporters may result in inadequate synaptic glutamate and may be involved in schizophrenia, in major depressive disorder (MDD) and bipolar disorder (BD). Vesicular glutamate transporter mRNA expression in the medial temporal lobe in major depressive disorder, bipolar disorder, and schizophrenia. Uezato A, Meador-Woddruff JH, McCullumsmith RE (2009) Bipolar Disord. Excitotoxic mechanisms and the role of astrocytic glutamate transporters in traumatic brain injury. Yi JH, Hazell AS (2006) Neurochem Int. VGLUTs are also widely distributed in the peripheral nervous system (PNS) such as the retina, trigeminal ganglion, dorsal root ganglia, intraganglionic laminar endings (IGLEs) of the esophagus, and enteric neurons. In these regions, VGLUTs are mainly localized in synaptic vesicles. In the retina, VGLUT1 is expressed in photoreceptor cells and bipolar cells, while VGLUT2 is expressed in ganglion cells. VGLUT3 is localized in a previously unidentified subset of amacrine cells. Coinciding with the expression of VGLUT2 in ganglion cells of the retina, the immunoreactivity of VGLUT2 is dominant in the dorsolateral geniculate nucleus and the superior colliculus, where retinal ganglionic cells terminate. VGLUT1 and 2 are co-expressed with substance P in nociceptive primary afferent fibers terminating in the medullary and spinal dorsal horns, suggesting their role(s) in nociception. 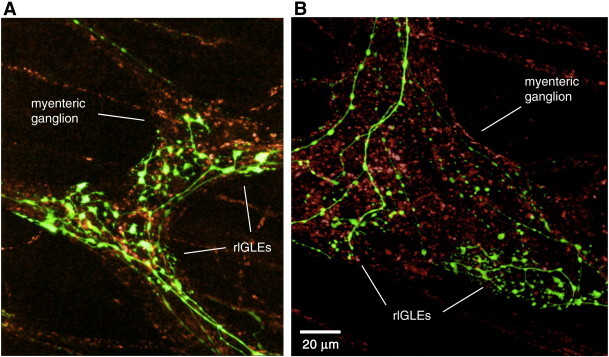 of VGLUT2 in IGLEs suggests a role of L-glutamate as a local signal molecule for myenteric neurons from IGLEs. In the brain-gut axis, VGLUT2 is expressed in the enteric (submucosal and myenteric plexus), nodose, and dorsal root ganglia neurons. It is suggested that glutamate signaling is used for afferent transfer of information from the mucosa to the enteric plexuses and brain. More diverse expression and localization of VGLUTs are observed in non-neuronal cells of peripheral tissues. VGLUT1 and VGLUT2 are associated with synaptic-like microvesicles (*SLMVs*) in pinealocytes and melatonin-secreting endocrine cells. Thus, pinealocytes are glutamatergic and the released glutamate becomes a negative feedback regulator for melatonin synthesis through an inhibitory cAMP cascade by way of mGluR3. A typical glutamatergic system can be seen in the Islet of Langerhans, a miniature endocrine organ for maintenance of blood glucose. In particular both VGLUT1 and VGLUT2 are specifically present in glucagon-containing secretory granules in a cells. This means that glutamate is co-stored and co-secreted with glucagon from a cells under low glucose conditions. Glutamate from a cells stimulates b and d cells by way of the novel GluR4c-flip ionotropic receptor. The b and d cells, in turn, secrete GABA and somatostatin, respectively; subsequently, the released GABA and somatostatin inhibit the secretion of glucagon and glutamate by way of GABA A and SSTR-2 receptors, respectively. Glutamate also acts as an autocrine transmitter and inhibits glucagon secretion by way of the mGluR4 receptor on a cells through an mGluR4-mediated inhibitory cAMP cascade. cells for glucagon-like peptide 1 (GLP-1), an insulinotropic agent. In L cells, VGLUT2 is expressed in GLP-1-containing secretory granules. Consistently both L-glutamate and GLP-1 are secreted from GLUTag cultured clonal L cells upon stimulation with high concentrations of glucose. Some preliminary experiment suggests that L cells receive glutamate signals that suppress secretion of GLT-1. Thus, although more extensive studies are necessary, it seems likely that glutamate signaling in the intestines and islets of Langerhans independently regulates blood glucose through regulation of secretion of insulin and glucagon, respectively. Vescicular glutamate transporter acts as a metabolic regulator. Moriyama Y, Omote H. (2008) Biol Pharm Bull. The expression and localization of VGLUT also reveals a novel type of glutamate signaling in bone. Osteoclasts degrade bone; then osteoclasts take up the bone degradation products through endocytosis, packed them into transcytotic vesicles, and secreted from exocytosis at the basolateral plasma membrane: VGLUT1 is associated with transcytotic vesicles. Thus, L-glutamate and bone degradation products are co-localized in and co-secreted from osteoclasts. The released L-glutamate suppressed transcytosis through the metabotropic glutamate receptor type 8 (mGluR8)-mediated inhibitory cAMP cascade. Thus, osteoclasts use glutamate signaling to report the status of bone resorption to regulate the balance of bone resorption and formation. Osteoclasts from VGLUT1-knock out mice have lost the glutamate secreting activity and this regulation, resulting in enhanced and uncontrolled bone digestive activity, which leads to osteoporosis. Secretion of L-glutamate from osteoclasts through transcytosis. Morimoto R, Uehara S, Yatsushiro S, Juge N, Hua Z, Senoh S, Echigo N, Hayashi M, Mizoguchi T, Ninomiya T, Udagawa N, Omote H, Yamamoto A, Edwards RH, Moriyama Y. (2006) Embo J. The detection of VGLUTs conclusively revealed where, when and how L-glutamate is secreted. Glutamatergic signaling is not restricted to the CNS but is one of the general and ubiquitous systems for intercellular chemical transmission. In neurocrine signal transmission, L-glutamate acts as an intercellular transmitter that transmits presynaptic stimuli to post-synapses. However, in paracrine or autocrine signaling, L-glutamate is co-localized and co-secreted with other factors, which in turn are modulated by glutamate through receptors. Thus, L-glutamate can act as an intercellular messenger that monitors the physiological output to maintain homeostasis. In this context, L-glutamate signaling acts as a metabolic regulator. The mode of glutamatergic signaling is diverse in nature: the storage organelles for L-glutamate, stimulus/exocytosis coupling, the kinetics of the appearance of L-glutamate signals, and the distance from the target cells are different. The identification of novel sites of VGLUT expression may reveal a novel regulatory mechanism of metabolism. Since VGLUTs are expressed in the PNS and neuroendocrine cells in the gastrointestinal tract, it is possible that L-glutamate signaling is somehow involved in gut nutrient perception. Very recently, SLC17A9, a novel homologue of VGLUT, was identified as a vesicular nucleotide transporter (VNUT) that is responsible for vesicular storage and subsequent exocytosis of ATP. Since purinergic signaling plays an important regulatory role(s) in the gastrointestinal tract, strategy similar to that of VGLUT discussed here will be useful for studying the mode of action of purinergic signaling.